Click Next, a window will appear advising you that it is configuring the network settings. An Error may be displayed asking you to search unencrypted. Click Next. If this fails to connect and you receive an error message tick the Manually configure server settings box and click Next. Select POP3 form the Account Drop Down. Ensure the radio button next to Use the same settings as my incoming server is selected and click Ok button. In the Incoming server field enter 995. Tick This server requires an encrypted connection (SSL). In the Outgoing server field enter 587. 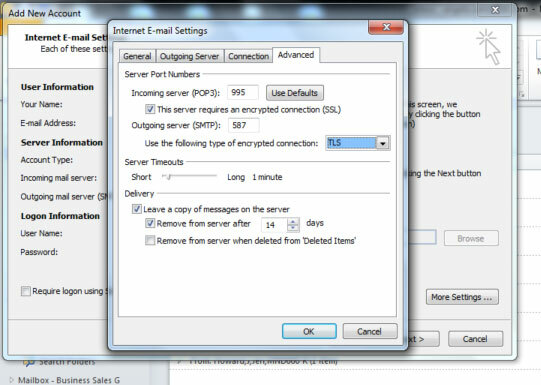 From the drop down menu next to Use the following type of encrypted connectionselect TLS. Click on Test Account settings and a results window will be displayed. Click Close to continue. A confirmation screen will be displayed. Click Finish. A list of email accounts will then be displayed.